At the Holiday Inn in the center of Berlin completed preparations for the opening of Twenty-Eighth meeting of the Conference of European Rabbis on Sunday. Conference held will mark 75th anniversary of Kristallnacht and score a decade of the founding of Orthodox CER Germany. 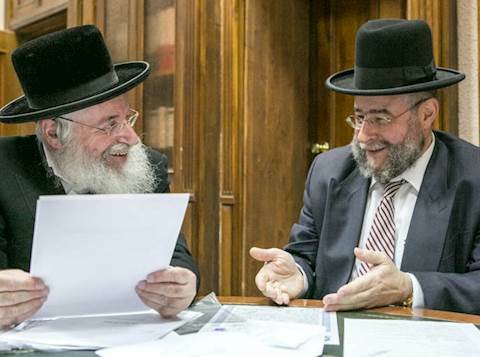 200 prominent European rabbis and judges, Europe Av Beit Din headed by Rabbi Hanoch HaCohen Erentreu, and the heads of Jewish organizations in thirty countries will participate in the conference held under the title - 'family, rabbi and community'. President of the conference, Rabbi of Moscow Rabbi Pinchas Goldschmidt said that the head of the conference talks will be subject of Jewish rights on the continent - the slaughter and circumcision, and practical ways to relieve marriage and divorce law. The conference will last three days during which participants will hear lessons from the major rabbis and judges in 11 seats , and it will close on Tuesday, the ninth of Kislev. The conference takes place for the 28th time since the organization was founded and is held every two years. Presidency "Conference of European Rabbis" long standing and Rabbi of Moscow, Rabbi Pinchas Goldschmidt. Guest of honor at the conference will be Rabbi Asher Weiss, Av Beit Din, Darcei Torah, accompanying the rabbinical conference with advice. Deliberations of the Conference will be raised also to the subject; plight of Torah world, the Land of Israel, given the harsh decrees. The yeshiva world which bears the head of Hebron Yeshiva, Rabbi Moshe Mordechai Farbstein, is coming to the conference to give a Torah lesson to the rabbis. At the conference the memory of Rabbi Yosef Elyashiv zt"l will be brought up who was Tel Talpiot for European rabbis and halachic advice , and Rishon Lezion Harav Ovadia Yosef zt"l who encouraged and supported the conference and was Tel Talpiot of rabbis in Israel and the Diaspora and was guest of honor at some of the conferences in Europe. Words in his memory will be carried out by rabbinic director of the conference, a member of the Moscow court and Rosh Yeshiva Toras Chaim in Moscow, Rabbi Moshe Lebel. Representing Israel will be the chief rabbis of Israel, Rishon Lezion and head of the rabbinical courts, Rabbi Yitzchak Yosef and President of the Council of the Chief Rabbinate, Rabbi David Lau. Guests from the U.S. Congress: Rabbi Yehiel Kalish, vice president of Agudath Israel in the U.S. President Federation of American Rabbis Rabbi Moshe Dratz, CEO Canadian fund welfare and education, Rabbi Shlomo Noach Mandel and Vice Chief Rabbi community Park East in Manhattan, Rabbi Benjamin Goldschmidt. The conference is sponsored by the conference to patrons under Boris Mints, chancellor of Jews in Germany led by Dr. Hubert Burda and the Jewish community in Berlin. A significant event to European Jewry would be the appearance of the Secretary General of the Council of Europe, Trovioren Yagland, which come as a special guest of the conference involving dinars and discussion on ' challenges of the future of European Jews, and after the Council of Europe decided a month ago that circumcision is injury to a child and European countries to ban this. It also announced the arrival of senior EU institutions. Ambassadors of the EU countries and German officials. Vice president of the Lauder Foundation and founder of the Berlin Yeshiva, Rabbi Joshua Spinner and Ms. Joelle Aflalo and Mr. Albert Aflalo Matanel Home Foundation and Chuliya, will guide the evening. On the evening of the first day of the conference discussions will be held a special memorial service in cooperation with the German government and the World Jewish Congress which will mark the 75th anniversary of Kristallnacht Interior Minister Hans Peter Friedrich, to be held on Bronnstrash, near the site of the Berlin Wall documentation. The rabbis will hear living testimony from Kristallnacht. Hgr"f Goldschmidt President will speak at the conference, president Hatzntralat of Jews in Germany, and the World Jewish Congress President Ronald Lauder. A special session will be devoted to the organization, Do Not Forget operating alongside the Conference of European Rabbis and Claims Conference protection and conservation of cemeteries and mass graves in Europe. Session will discuss the formulation of political strategy and lobbying for legislation to establish legal improvement. Resolution 1883 of the Council of Europe for the protection of cemeteries and a number of halachic questions in care of cemeteries in Poland and Spain and other countries. Participating in the conference are leaders and representatives of many Jewish organizations, including representatives; authorized world, Candle tame, Amiel Institute. Diaspora Torah Culture Department of the Jewish Agency and Keren Norwood from England. The conference was first held on German soil is of great interest especially in Germany and throughout Europe and the European media interest in the record as a whole.